few sausages or sausages cut into pieces. You will need your bento box (best with 2 separate containers), a rice cooker or pot to cook rice, and another pot or frying pan to cook your sausages. Wash and then cook rice according to your rice cooker's instructions, or follow guide on the packaging when cooking rice in the pot. Fill the bottom bento container with piping-hot rice and set aside to cool down, covered with a paper or clean cotton cloth to keep the moisture in the rice. Depending on the size of your sausages, cut them into smaller pieces, then cut them all over or each end, depending on your liking. Pictured sausages were cut on 2 opposite sides in a diagonal cut. You can boil the sausages in the pot, with some teriyaki sauce to keep them tender, or you can fry them in a frying pan with some vegetable oil and teriyaki marinade to keep brown them nicely, depending on your liking. Set your sausages aside to cool down. 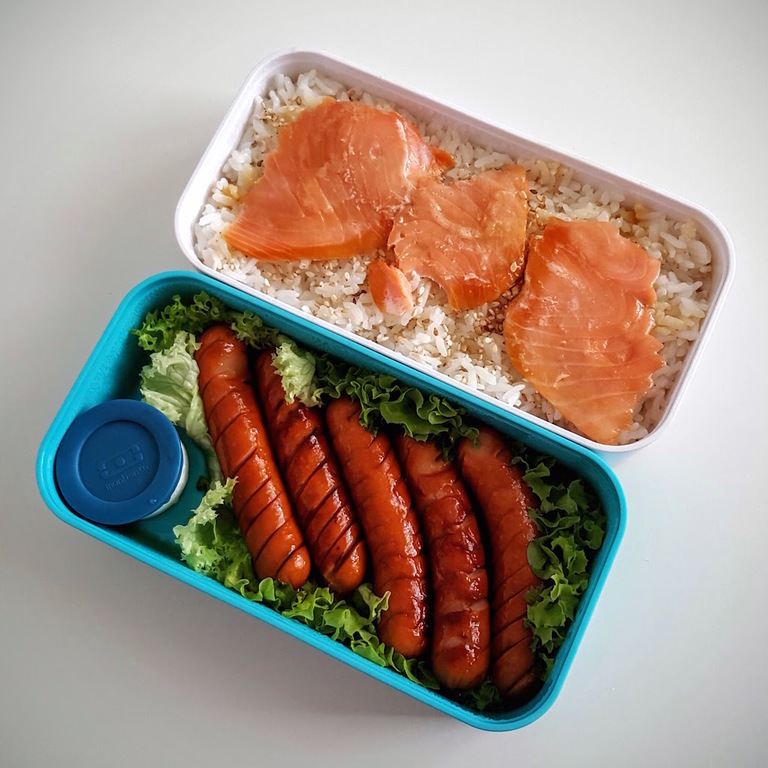 When both rice and sausages are cooled down, you can assemble your bento box — remember to never close the bento box while ingredients are still hot, because the moisture will ruin the flavors, consistency and can also benefit bacteria growth. Put smoked salmon slices on the rice, then smudge them with a bit of teriyaki sauce and sprinkle lightly with sesame seeds. Now you can close container! Put the barbecue sauce container in the top bento container, then fill remaining space with lettuce leaves and put sausages on top. Close the container, your bento box is ready!